Sepsis Alliance is the leading sepsis organization in the U.S., working in all 50 states to save lives and reduce suffering by raising awareness of sepsis as a medical emergency. In 2011, Sepsis Alliance designated September as Sepsis Awareness Month to bring healthcare professionals and community members together in the fight against sepsis. The organization was founded in 2007 by Carl Flatley, D.D.S., M.S.D., whose daughter Erin unnecessarily died of sepsis when she was 23 years old. 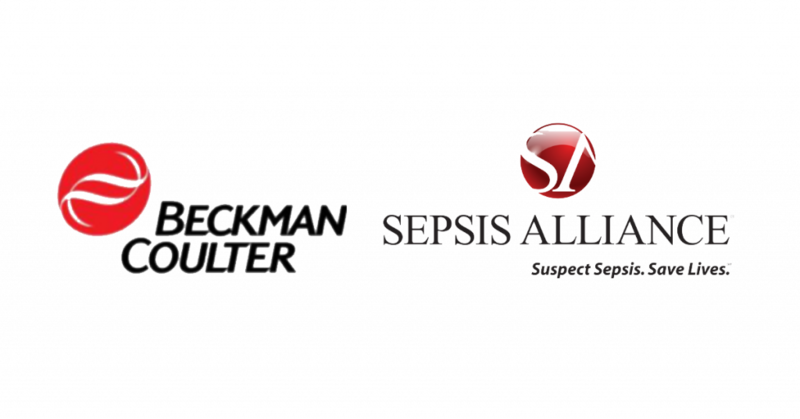 Sepsis Alliance gives a voice to the millions of people who have been touched by sepsis – to the survivors, and the friends and family members of those who have survived or who have died. Sepsis Alliance is a 501(c)(3) charitable organization and a GuideStar Gold Rated Charity. For more information, please visit www.sepsis.org. Connect with us on Facebook and Twitter at @SepsisAlliance. Beckman Coulter Diagnostics helps healthcare and laboratory professionals provide better patient care by delivering the accurate diagnostic information they need, when they need it. With a rich 80-year history, Beckman Coulter is a partner of choice for healthcare organizations. Our scalable instruments, comprehensive diagnostic tests and business management services are trusted by hospitals, laboratories and other critical care settings around the world. We share in our customers’ mission toward continuous improvement and quality patient care because we believe when efficiency and clinical outcomes are improved, patients benefit and we can move healthcare forward for every person. © 2018 Beckman Coulter. All rights reserved. Beckman Coulter, the stylized logo, and the Beckman Coulter product and service marks mentioned herein are trademarks or registered trademarks of Beckman Coulter, Inc. in the United States and other countries.